Pets Costs > How Much Does a Pet Tarantula Cost? How Much Does a Pet Tarantula Cost? Belonging to the Theraphosidae family, there are over 900 species of Tarantulas that have been identified. Commonly found in the southern states of the United States, this spider can grow up to four inches long, and its legs can span as wide as 12 inches. While many fear this so-called spider, many have one as a pet in their homes. The cost of a pet tarantula is going to vary depending on the species, where you purchase it and its age. The cost of a pet tarantula is going to vary depending on the species, where you purchase it, the quality and its age. On average, expect to spend anywhere between $25 and $350 for a tarantula based on the factors above. Refer to the table below to see what most popular species cost. For example, a Brazilian Black and White Tarantula can cost anywhere from $65 to $80, while a Brazilian Salmon can cost anywhere from $90 to $130. Chaco Mousy Browns can retail for anywhere from $35 to $62. More expensive species, such as the Ecuadorian Birdeater, can cost as much as $325, while a simple Rosehair can retail for $15 to $35. A tarantula can often be found at Petco and Petsmart. Petco, for example, offers 25 species, and most will be less than $30 for just the spider. Tarantulas, depending on where you purchase one, can either be sold as a spiderling or an adult. Unlike a cat or dog, spiderlings will be cheaper to purchase since spiderlings can be very delicate and can oftentimes be harder to raise them, especially for beginners. Spiderlings have increased chance of dying while molting and can be harder to feed since they have to eat smaller flies or crickets when compared to an adult. As for adults, they are easier to feed and have a much greater chance of surviving adulthood when they mature. Most adults will be wild caught, while the spiderlings will be captive born. A tarantula doesn’t need a lot of space to live, but it will require a small setup in order to survive. Experts will recommend a 10-gallon aquarium with a secure top for your spider if you’re purchasing an adult, but a smaller aquarium and slowly graduating the spider as they grow old. A 10-gallon aquarium, depending on the materials it’s made from, can cost anywhere from $12 to $45. Substrate soil, bark and a heat lamp to maintain humidity levels. While optional, it is best to have accessories such as rocks and tiny holes where they can hide. Recurring costs such as food can be about $5 to $15 per month, depending on the spider’s diet; most will eat crickets or flies. As an adult, a tarantula should be fed twice per week, depending on their hunger levels and the humidity should be kept high if it’s a tropical species. On average, females are going to live longer than males. While most can live around 5 years, it is not unheard of for one to live for more than 25 years. However, the average lifespan will be between three to 11 years as long as they well taken care of. 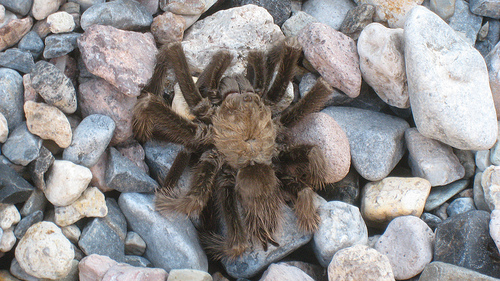 Keep tarantulas away from pets such as cats and dogs. One bite from the spider can be fatal to your pets. Always have medication or cures available in case a tarantula does bite you. Cornell University says the Chilean Rose Hair, which tends to be the most popular tarantula used as a pet, is lovely, cheap but extremely boring. They tend to be lazy and will be very hesitant when attacking prey. The website goes on to recommend the following species: the Pinktoe, Costa Rican Zebra, Mexican redknee, Trinidad Chevron and African Baboon. All tarantula species won’t be created equally. Some will be more interesting than others, while some may be plain boring, sleeping all day with very little action. Just like a dog breed, the species will matter when you purchase one. Try to purchase one that meets your budget, patience and squirminess. For example, if you’re afraid of spiders or get scared easily, consider a spider that moves slower. Due to the tarantula’s thin exoskeleton, the abdomen area is extremely thin, and if you were to drop one, they can splat, leading to internal bleeding. Experts highly advise you don’t handle your tarantula unless you absolutely have to. To minimize bites from occurring, never put the spider in a defensive situation. Just like other wild creatures, if it feels threatened, it will go on the defense, attempting to bite you. These fangs, if they were to bite you, would be sharp enough to penetrate into your skin. Although a bite may be scary, a death from a tarantula sting has never been recorded.